NDSS volleyball team will begin their KASSAA season next week. File photo. KASSAA’s winter season will get underway next week and the NDSS Golden Hawks will once again field a full slate of teams. On the ice both the girls and boys hockey teams will be seeking a bit of revenge following early playoff exits last February. 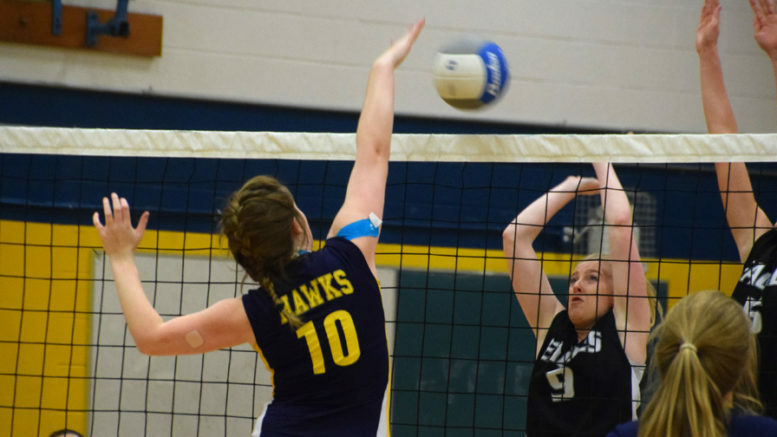 After finishing first overall in the league in 2017-18, the lady Hawks were upset 2-1 by the fifth ranked La Salle Black Knights in the semifinals. On the boys’ side, the Hawks were 5-2 in the regular season last winter before losing in the quarter-finals to fifth ranked Sydenham. All of that will be in the past on Monday however as the puck drops on a brand new KASSAA season. NDSS’ girls team will host Regiopolis-Notre Dame on the SPC’s Goodyear rink at 3 p.m. Meanwhile NDSS’ boys team will open their season on the road Wednesday when they also face the Panthers. Puck drop is 2:30 p.m. at Kingston’s Invista Centre. Meanwhile on the hardcourt the Hawks’ basketball program will look to build off last year’s playoff appearance. NDSS’ junior team went 4-5 last year while the seniors were 2-7. Both were eliminated in the KASSAA quarterfinal. They’ll open the 2018-2019 season by hosting their cross-county rival Ernestown Eagles. The juniors tip-off at 3:45 p.m. while the seniors play at 5:15 p.m.
NDSS’ girls volleyball will also open the season against Ernestown, only they’ll be on the road. The juniors will play at 3:45 p.m. while the seniors begin at 5:15 p.m.
NDSS will also have curling, alpine skiing, badminton and swimming teams competing at KASSAA championships in the new year.